INDUSTRY.co.id -Jakarta - Thousands of young people take part in picking up trash outside and inside the 2018 Asian Games competition. These volunteers are incorporated in #kontingenkebaikan Aqua which is supported by Indorelawan to participate in spreading the values ​​of the Indonesian heritage. Danone Communication Director in Indonesia Arif Mujahidin said, #KontingenKebaikan Danone-Aqua is a movement to invite all Indonesian people to do good deeds which are inherited from Indonesian cultural values ​​such as hospitality, mutual cooperation and help, so that they can bring the nation to the eyes of the world. as a good host. 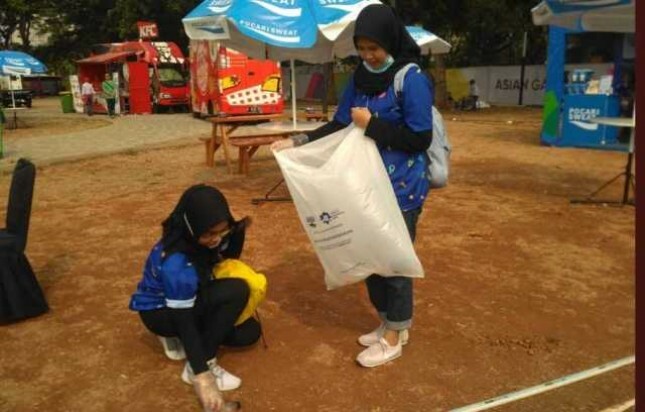 "At this Asian Games event, 4,000 volunteers went down and educated the public to keep the environment clean and healthy while ensuring the cleanliness of the venue. During the 2018 Asian Games, #KontingenKebaikan conducted various activities in four areas in Jakarta, namely Jakarta (GBK, Kemayoran ), Bogor (Pakan Sari Stadium), and Palembang (Jakabaring), "Arif said, Monday (8/27). "In each of these locations, there will be a Danone-Aqua booth where #KontingenKebaikan conducts activities such as education on the importance of sorting garbage and recycling waste and we also provide Smart Drop Box - an intelligent waste management box program at Alfamart outlets around Asian venues Games, "Arif added. This activity received appreciation from citizens. Nathalia Bellatrix, who is a member of the good friends in her Instagram account @ Nadaniabellap, said, "Even though I don't watch and don't appear on GBK, but this is my way to support the 2018 Asian Games. Friends who have struggled to show their best, together with #KontingenKebaikan also wants to give the best for Indonesia. " "Our work may seem trivial, but we believe that with the clean up action of GBK, we can support Indonesia as the best host," he said. In line with the Danone-Aqua commitment, Maritta C. Rastuti, Executive Director of Indorelawan also gave appreciation. "We saw what Danone-Aqua did through the #KontingenKebaikan campaign in line with Indorelawan's invitation to 'change good intentions' to be a good action today," he said. "This collaboration is also very fitting with our mission, which connects organizations with volunteers to encourage the spirit of mutual cooperation as a lifestyle for the people of Indonesia," he said.